Famed U.S. Olympic gymnastics coach Bela Karolyi is not a fan of little girls. At least not ones who can beat his team in the Olymics. 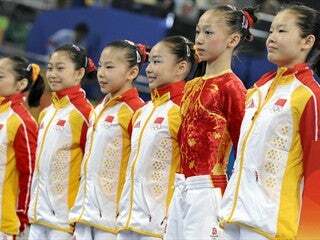 Karolyi is raising a fuss about the ages of the Chinese gymnast, claiming that they do not appear to be the competition legal age of 16. Clearly the world's most famous gymnastics coach is forgetting that NONE OF THE GYMNASTS LOOK 16. "They are using half-people," Karolyi said. "One of the biggest frustrations is, what arrogance. These people think we are stupid. Well if they're half people, then it's definitely a problem. The question is, which half are they using? The top or bottom? Or is it a split down the middle situation? Karolyi's solution, rather than tighten up the monitoring, is to do away with the age limits all together. And his wife agrees. "If it's true," she said of any nation using underage gymnasts, "the only situation is to lift up the age limit. It would be an even playing field for everyone." Brilliant plan. They should start a new event, toddler tumbling. Raid every orphanage for the most flexible kids and bring on the 6 year olds. You have GOT to be kidding. Let me remind you that Karolyi and his wife have been criticized by some of his former gymnasts claiming abuse. The whole "if you can't get them to follow the rule, take away the rules" mentality is lame. Unless you're talking about steroids.